The United States Congress designated the Calico Mountains Wilderness (map) in 2000 and it now has a total of 64,968 acres. All of this wilderness is located in Nevada and is managed by the Bureau of Land Management. The Calico Mountains Wilderness is bordered by the High Rock Lake Wilderness to the north. 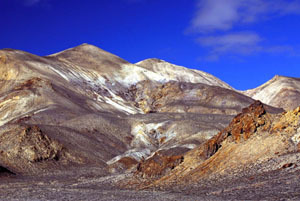 The Calico Mountains Wilderness includes the southern portion of the Calico Mountains a typical north-south trending Great Basin mountain range. Elevations in the wilderness range from 3,950 to 8,491 feet at Donnelly Peak. Sagebrush is the dominant vegetation type, with saltbush and greasewood occurring at the lower elevations. Several canyons also contain willows, cottonwoods, aspens and other riparian species. The Calicos were named for the colorful rock layers and formations that make up the southern portion of the range. Wildlife that inhabits the area includes mule deer, California bighorn sheep, pronghorn antelope, mountain lion, kit fox, coyote, and sage grouse. The area has a typical climate of the Great Basin; hot summers with temperatures over 100 degrees F and cold winters with temperatures often below 20 degrees F. Although some of the canyons contain perennial streams and springs, they should not be relied on as a source of water and a sufficient amount of water should be carried. Because the area has poor cell phone coverage the only reliable form of communication is by satellite phone. Access roads to the area are very rough and visitors should have high clearance four wheel drive vehicles with extra gas and two spare tires. Planning to Visit the Calico Mountains Wilderness? How to follow the seven standard Leave No Trace principles differs in different parts of the country (desert vs. Rocky Mountains). Click on any of the principles listed below to learn more about how they apply in the Calico Mountains Wilderness.